Mexico is a country full of lovely food traditions; recipes that have been in families for a long time and today’s recipe is that type of dish that when you are cooking it, you can’t help wondering how it began, who created it and how come it tastes so good. 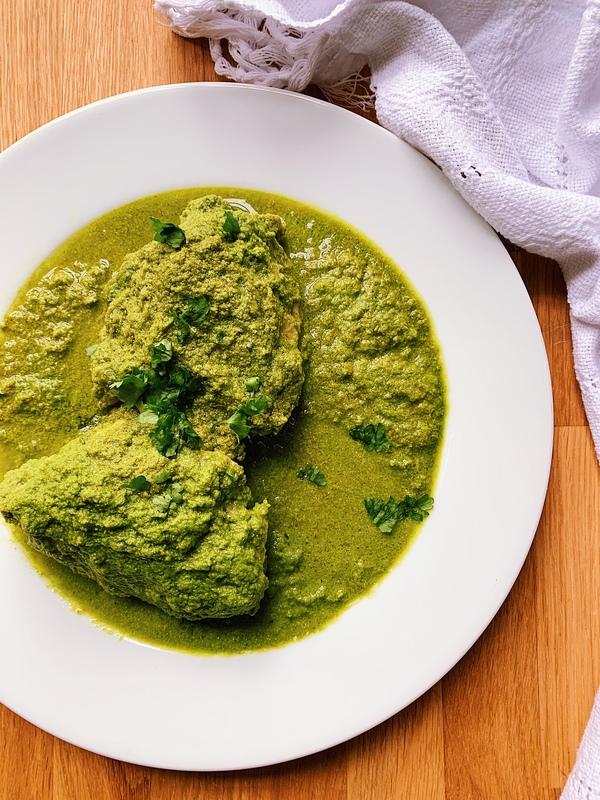 Green Pipian or Pepian is a dish from the centre of Mexico and it is call like this because the main ingredient is the pepitas (pumpkin seeds) that helps thickens the sauce. I know mine is probably not very traditional, but I live in London and here, sometimes I do not find the right ingredients for my recipes, so I have to improvise with what I find, but I always try to get the flavours as closer as the ones that you can get in Mexico. I hope you have the time to do this recipe and let me know if you like it! Have a lovely weekend! Charred the green peppers on the hob burner. Once the skin has blacken, wrap it in a plastic bag and keep aside. Heat a frying pan on high heat and toast the sunflower seeds, around 5 min, stirring constantly to avoid burning. Do the same with the sesame seeds. Reserve. Remove the green peppers from the plastic bag and take away all the black skin, deseeded, remove stem and cut. Transfer the green pepper, onion, garlic, radish leaves, coriander, spinach leaves, tomatillos, jalapeño chillies, some of the chicken stock, epazote and oregano to the blender and blend until getting a smooth sauce. Heat a sauce pan to medium heat and add 2 tbsp oil, once hot, add the green sauce and cook for around 10 min, when it starts boiling turn the heat down and continue cooking for 15 min stir from time to time to avoid sticking. Then transfer the toasted seeds into the blender, add some chicken stock and blend three times to get a smooth consistency. Add the seed mixture and rest of the chicken stock to the green sauce, check the seasoning and leave to cook for 10 min more. While the pipían sauce is cooking, heat a casserole dish to medium heat and add the rest of the oil. Season the chicken with some salt, ground black pepper. Seal the chicken in the casserole dish, once brown, add a bit of water and cover, let the chicken cook in its own steam for around 30 min. 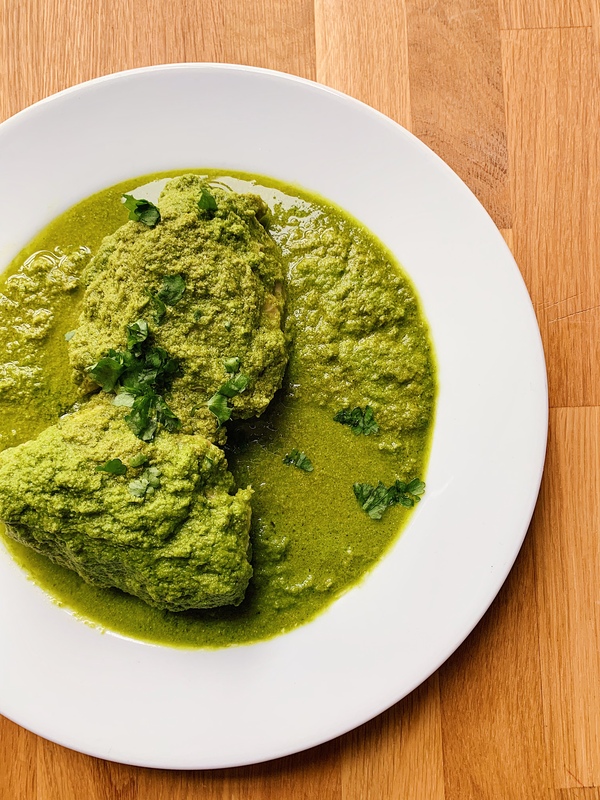 To plate, serve the chicken on a large plate, cover it with the green Pipían sauce and scatter some coriander. Have some Mexican rice with it. Am I to understand that you cook the sauce for 35 min? Mine came out much thicker looking than yours does. The flavor is pretty “green” and nutty. Is this what you’re looking for? I might try to thin it out with more ck broth and blend it again. My baby loved it but my hubby was not so convinced. Also I have a TON of sauce leftover. Thoughts on what to do with it? What do you usually make with the ck as accompanying side dishes?